The new government in 1870 prepared an ambitious plan to create a navy with 200 ships organized into ten fleets but it was abandoned within a year due to lack of resources.The true was that Japan at the time was not a rich country. However, Japan also received the support from British to develop the navy. 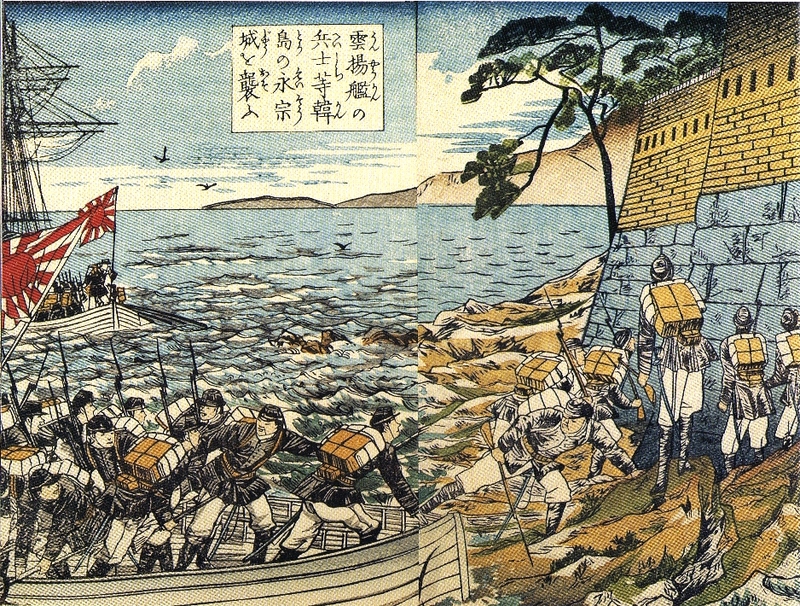 During the 1870s and 1880s, the Imperial Japanese Navy remained an essentially coastal defense force, although the Meiji government continued to modernize it. In 1870, an Imperial decree determined that Britain’s Royal Navy should be the model for development, instead of the Netherlands.In 1871, the ministry resolved to send 16 trainees abroad for training in naval sciences (14 to Great Britain, two to the United States), among which was Heihachirō Tōgō. A 34-member British naval mission visited Japan in 1873 for two years, headed by Commander Archibald Douglas. Later, Commander L.P. Willan was hired in 1879 to train naval cadets. Douglas was born in Quebec City in pre-Confederation Canada in 1842 and was educated at the Quebec High School. He joined the Royal Navy as a cadet in 1856. He was selected to head the second British naval mission to Japan in 1873, and served as a foreign advisor to the fledgling Imperial Japanese Navy until 1875. He was based at the Imperial Japanese Navy Academy, then located at Tsukiji in Tokyo, where he trained a class of 30 officers. During his tenure, his advice was called upon for the Taiwan Expedition of 1874, the first major overseas deployment for the Japanese navy. In his stay in Japan, he also spent time introducing the sport of soccer to Japanese naval cadets. The first Japanese interventions abroad using navy were in 1874 in Taiwan and in 1875-76 in Korea. By 1874, the Taiwan expedition was the first foray abroad of the new Imperial Japanese Navy and Army after the Mudan Incident of 1871, however the navy served largely as a transport force.Various interventions in the Korean peninsula continued in 1875–1876, starting with the Ganghwa Island incident provoked by the Japanese gunboat Un’yō, leading to the dispatch of a large force of the Imperial Japanese Navy. As a result, the Japan–Korea Treaty of 1876 was signed, marking the official opening of Korea to foreign trade, and Japan’s first example of Western-style interventionism and adoption of “unequal treaties” tactics. In 1878, by first time the Japanese cruiser Seiki sailed to Europe with an entirely Japanese crew. The Warship Un’yō was ordered in Britain by the Chōshū Domain in 1868 and built in Scotland by A. Hall & Co., Aberdeen. When she was turned over to the Domain in February 1870 her name was Un’yō Maru. On July 25, 1871, she was transferred to the Meiji government to be part of the newly formed Imperial Japanese Navy, as the Un’yō. 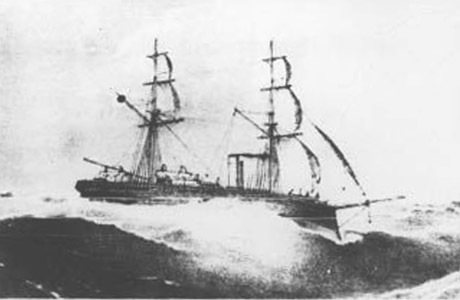 The warship un’yō was one of the ships dispatched to Kyūshū in 1874 during the Saga Rebellion. In May 1875, she carried diplomats to Busan in Korea in an attempt by the Japanese government to open diplomatic relations with the Joseon dynasty government. When there were problems in these negotiations, the Japanese government again dispatched Un’yō in September 1875 under the command of Inoue Yoshika to estimulate a military response, in what was later termed the Ganghwa Island incident. This eventually led to the Treaty of Ganghwa, which opened the Korean Peninsula to Japanese trade. In 1876, Un’yō was assigned to assist in the suppression of the Hagi Rebellion, another uprising of disaffected former samurai. Un’yō was severely damaged when she ran aground off the coast of the Kii Peninsula, and was scrapped the following year. 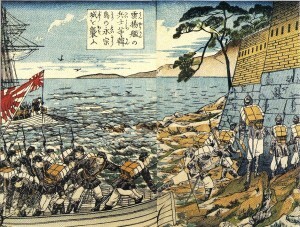 Soldiers from the Un’yō attacking the Yeongjong castle on a Korean island. In 1875, the warship Un’yō, under the command of Inoue Yoshika, was sent to survey coastal waters without Korean permission. On September 20, the ship reached Ganghwa Island, which had been the scenario of violent confrontations between Korean forces and foreigners ( French expedition 1866 and an american expedition 1871) in the previous years. The memories of these disputes were very fresh, and it was clear that the Korean garrison would shoot at any approaching foreign ship. Nonetheless, Commander Inoue ordered a small boat launched – allegedly in search of drinkable water. The Korean forts opened fire. The Un’yō brought its superior firepower to bear and silenced the Korean guns, then sent a landing force ashore to fight the Koreans on land. The Japanese ended their attack and withdrew back to Japan. The number of casualties is not well-known. After the incident, the Imperial Japanese Navy forced a blockage and requested an official apology from the Korean government. After several conversations, it was decided to dispatch the Kuroda mission. The signing of the Treaty of Ganghwa was done on February 27, 1876. This treaty finally opened the Korean Peninsula not only to Japanese but also to foreign commerce.